Director E J Yong has this brilliant idea that not a lot of directors have ever done before: filming a short documentary while he is not on the set at all. Thus, he calls popular actors and actresses to come on set to film a short film . Later, they found out that Director E was in Hollywood for filming. 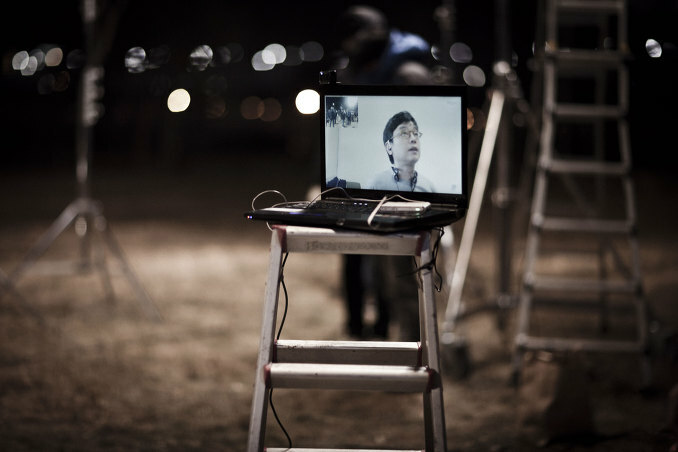 Instead, the director calls via Skype and mobile phones to overlook the overall process of filming. They have to film on their own with the ‘director’s’ instructions even though he is not on the set. They were shocked that he is not there. Still, they decided to follow the director’s crazy idea. Directors like Lee Joon Ik and Im Pil Sung were on the set. They have to film this documentary for two days only. This is based on how people who are involved in this filmmaking process going through the ups and downs while the director is physically not there. The director’s idea is brilliant and crazy. It started to be smooth sailing but things started to get stressed out. This is related to what would it be like if communication technology, which is Skype and mobile phones, could influence the whole filmmaking process on set. Thus, having the director physically not showing up make things going topsy-turvy. Technology may be their closest thing that people can live without but that is not the case for filmmaking. For example, the buffering Internet connection causes the Skype call either disconnected or having laggy conversation between directors and actors. Also, it is difficult to determine how well the actors portray the characters, based on their acting, tone of voice, lighting, and other elements especially on a tight schedule. Casts acting as if they are working on the film set. Some act as film crew and film industry professionals while others act as themselves the actors. I enjoyed it is based on ‘layer-to-layer’ concept in filmmaking. Director E’s purpose is to present this ‘documentary’ in his ‘film’ with the idea about the director who is away from the set. It is reflecting on the director’s idea that is implemented into the script and storyline. There were a lot of shifts between two filmmaking scenarios on the set. It is opening up layer by layer while each layer is linking to the main idea. The ‘short film’ has little bits of funny elements where the ‘director’ is on a romantic getaway with his girlfriend. On the other hand, the ‘film’ focused on the casts thoughts and struggles when the director is not there at all. There is a balance of both sides while linking to the big picture that audience would understand the ‘behind-the scene’ of filmmaking. What is interesting is to watch and listen to the casts’ point of view when being on set without the director being there. At first, they were fine with it as they can communicate through Skype. However, later, it pressures them a lot as there was a lack of communication among the team including filmmaking team left a little confused without the director’s presence. Each cast vented their emotions and struggles while on set especially talking about their previous experience in other films with directors which give audiences some broad insights on the Korean filmmaking process. Such examples like an actress is asked to say the same line over and over until Director E gives an OK and an actor who says that he wants to do again as his acting for a scene is not good enough even though Director E tells him that they are on a tight schedule. Director Lee Joon Ik and Yim Pil Sung’s actions and perspective lead them to question how does it feel when Director E is not there. It causes the whole set into chaos that Director Lee jumps in to help out. The ‘situation/idea’ affects each and everyone’s thoughts that is both an exciting and frustrating experience. The idea about director physically not being there is unique and also conveying a filmmaking situation when technology comes into place. Having ‘layer-and-layer’ scenario links to the big picture. It not only shows the bright side of filmmaking with Skype calls and mobile phones but it presents how the filmmaking team worked together as a team, both mentally and physically, to make a film with good takes. It leads to the question which some film industries thought about is how far communication technology could impact the filmmaking, both local and international including co-production. Does it benefit them or is it a burden? I would say it is both but the important thing is the communication and understanding among the filmmaking team and casts with similar goals including making ‘the’ films that audiences could enjoy which make them feel that they have put a lot of effort into making it. It is a ‘must-see’ film on seeing the ‘director’ who is shown through the laptop screen where it is behind the camera in making the short film about his craziest idea ever.